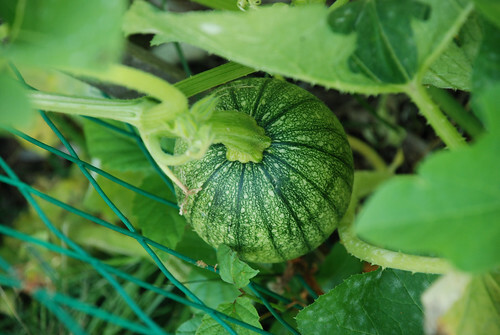 Tall Tales: Pumpkins, watermelons and cucumbers! Oh my! What was I thinking? I crammed three vining plants into a tiny garden space. They kept to themselves so nicely in the beginning. But now, well, it's getting a little "Little Shop of Horrors" out there. 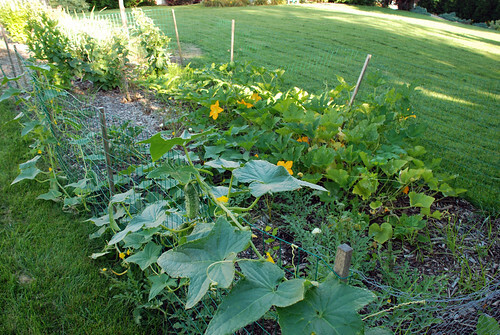 The pumpkins are knocking the fence down and the cucumbers are taking over the neighbor's lawn. Even my slow-to-start watermelons are breaking out of their confines and are heading towards the apple tree. Every time I go out there I expect one of these little guys to look at me and say, "Feed me!" In reality, the only thing they are demanding is space. I'll have to make sure Walter keeps his distance – all those vines just might sweep him away! Perhaps they are making a break for the Emerald City to ask the wizard for more space! If you have any extras, I'll take em! I think all my vines are only going to amount to a big pile of gourds. It may be time to eradicate them!